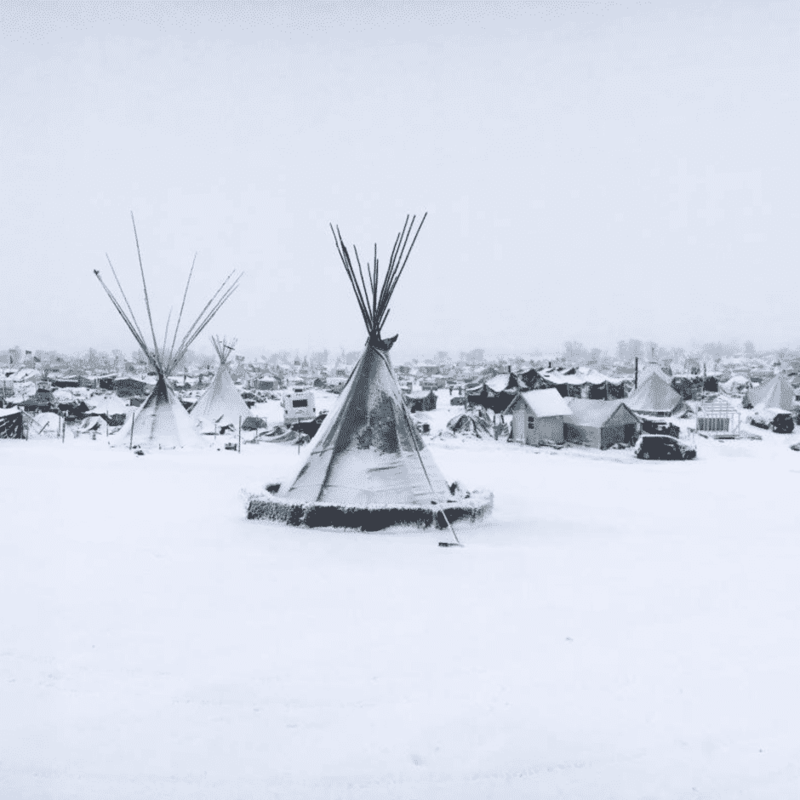 Vogue, November 22, 2016 : “Snow still covered the plains when the first tepees and tents were staked in the ground near the Standing Rock Sioux Reservation by a confluence of the Missouri and Cannonball rivers. It was April 1, 2016, a Friday. 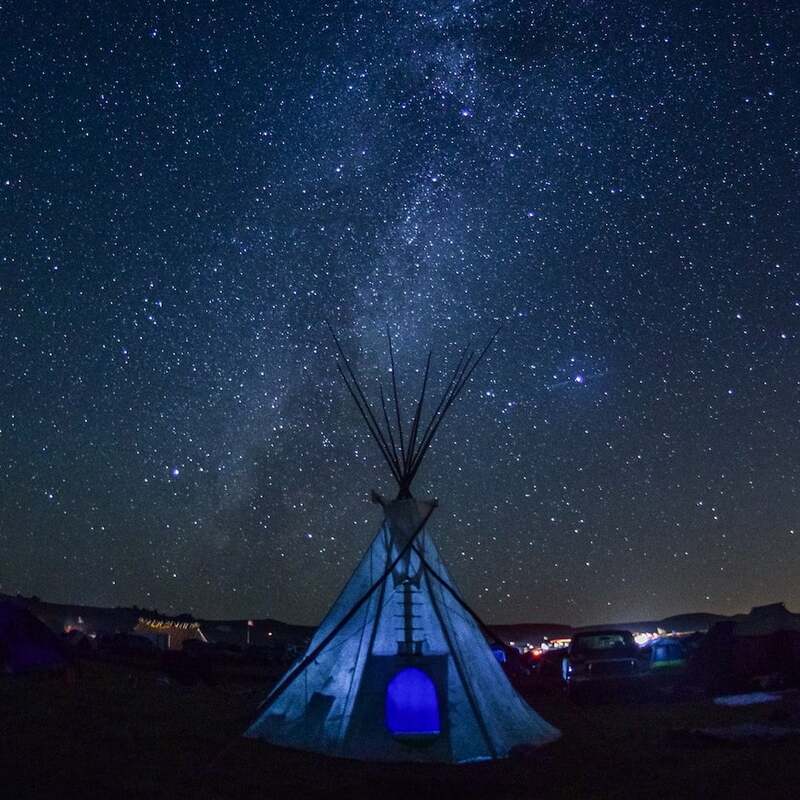 This small encampment would grow into an unprecedented gathering of native North American tribes and nations united in an effort to protect water and land. Together they would build a resistance movement rooted in nonviolence and community that, nearly eight months later, shows no signs of backing down, even in the face of mounting violence against it. Newsweek, Nov 28, 2016 :“… Some news reports claimed that activists had set fires and that the police were simply trying to extinguish them. But my social media feed, full of updates from firsthand observers, told a different story: It said police in riot gear were firing water cannons, along with tear gas, rubber bullets and concussion grenades, to keep activists from crossing the bridge. These reports were later confirmed by The Washington Post. And, one of the results of awakening can be the discovery of … love and compassion, manifesting as sensitivity to the suffering of others. 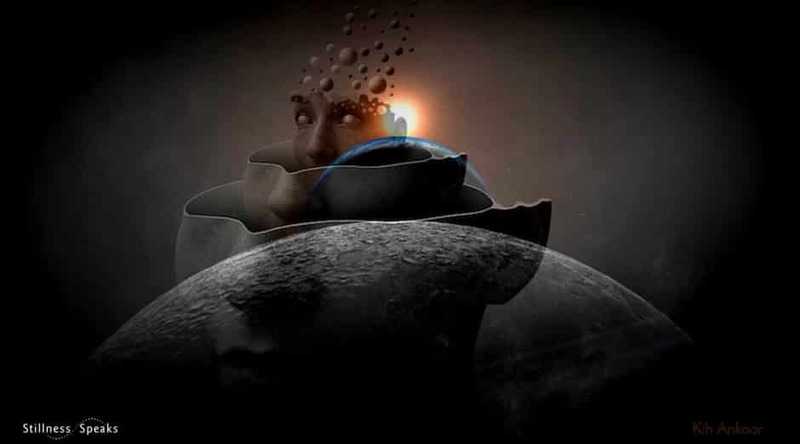 As the attachment to separation dissolves, the desire to peacefully become socially engaged increases … to do whatever we can … to be of service to humanity and the planet. To this end, since August of this year, Cherie has been monitoring the situation at Standing Rock and gradually sharing about it on her personal facebook, with increased sharings in the last couple weeks … then recently, we also started sharing on Stillness Speaks’ social channels (facebook, twitter, google+) plus Chris’ facebook. And, last week, Chris decided to express his solidarity in person – by going to the Oceti Sakowin camp over the Thanksgiving holiday period … we include his words, below, from that short trip. Also, we will dedicate our next newsletter to supporting this most important matter by providing it’s history, the impact of the Dakota Pipeline, current happenings at the Standing Rock community, how to keep up with the ongoing developments, how to participate, especially ALL the various ways to help and contribute (e.g., to Oceti Sakowin camp, or to Stand with Standing Rock or to petition President Obama) … so stay tuned! UPDATE: Nov 30, 2016: Here’s the newsletter. I have just returned from the Oceti Sakowin Camp at Standing Rock. Early last week, as I felt into the ongoing Standing Rock matter, I just could not think of a better place to be on Thanksgiving … to support and serve those in need there. What I experienced there was both deeply moving and troubling. Even in the midst of real and potential threat to personal safety and rapidly growing group activities, the Dakota Pipeline water protectors are, and remain, anchored in prayer and spiritual principles. It is something I have never ever witnessed before. It is such an honor to be here .. such a deep feeling of gratitude. More than 500 protectors have been arrested. More than 100 have been injured and many have been hospitalized. Consider what the Protectors are going through: the weather, blocked public access roads, eviction notices, militarized police, caring for each other, deploying hundreds of volunteers to build shelter, collecting warm clothing, feeding thousands of visitors, nursing their wounds … and much more. The weather is cold and snow is now covering the camp. While I was at Standing Rock, the Army Corp of Engineers officially announced an eviction deadline of December 5th of the largest gathering of Native American tribes and thousands of Water Protectors from as far as Afghanistan. 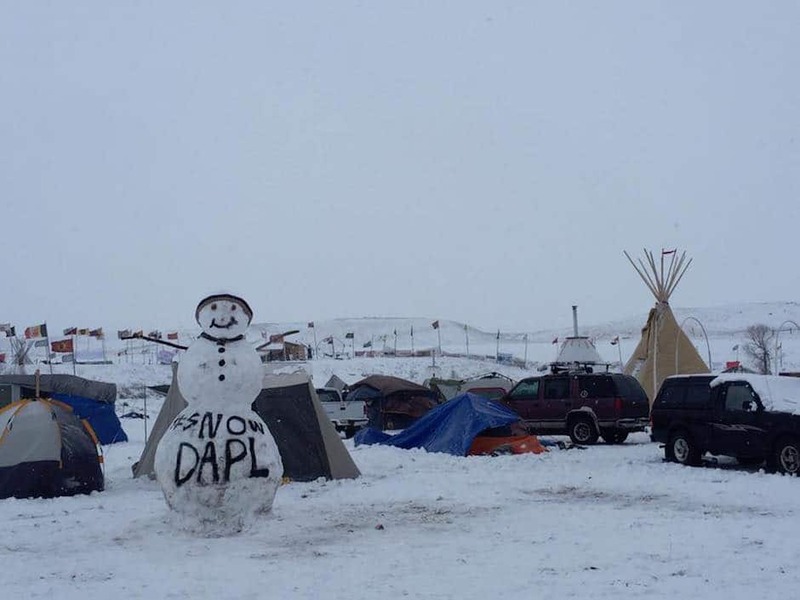 It has been reported that there are now 500 native American tribes at the Oceti Sakowin Camp at Standing Rock. That would make it the largest tribal gathering in history. I am deeply concerned that December 5th could become a day that lives in infamy. It was quiet yesterday and many were busy building new, wooden structures to accommodate and shelter the continuing stream of new arrivals. There is no indication that anyone is leaving or preparing to dismantle the camp. Today, Nov 28th, the Army Corps Of Engineers has said it does not intend to force protectors to leave on December 5th – yet, the “clarification” goes on to state that those who do not leave do so at the risk of arrest. I shot a video during my short visit … I really had to think about posting this video from the camp. This has been a very emotionally difficult experience for me and some of my comments may seem controversial. But, I am posting it hoping that, by sharing what is really happening, right now, right here at Standing Rock, we will keep our focus and continue to show our support. Your attention helps hugely. The main stream media have finally taken notice as evidenced at the Press Conference today. Please know that you really make the difference as you are the conscience of the country and the world. This is not about me … it is about everyone. ==>> It is about water. ==>> It is about the use of private militarized forces in conjunction with the local, state and federal law enforcement authorities. ==>> It is about mass surveillance of the citizenry. ==>> It is about fear and intimidation and lawless behavior. ==>> It is about our planet and our children. ==>> It is about my Deep Gratitude for everyone who gives attention to this and helps to get the facts out. I recognize that life is busy … the holidays are here … but please don’t forget that thousands are living in sub-freezing conditions on behalf of all people who care about our planet, our children, our love in the face of the tightening grip of a growing private military determined to place commerce before human life. It seems sort of redundant as events unfold here – may seem that it’s just more conflict, more injury. But, it’s not ! Standing Rock is actually a very bright spot – a gathering of the peaceful to offer support and awakening. Your attention is our best defense and offense. Thank you all for not allowing this issue to get lost in the ongoing flood of news we get daily. It makes a big difference. And Thank you also for allowing me the privilege of using our community’s lists to help garner attention. Standing Rock needs your help. Badly. December 5th is less than 7 days away. H.H. The Dalai Lama Quote from ecodharmacentre. Images: 1) Sunset at Standing Rock Rising, 2) A No DAPL Map from Huffington Post, 3) Waterways at Standing Rock Rising, 4) Night at Standing Rock Rising – 1), 3), & 4) by Redhawk, 5) Snow at Sacred Stone Camp (different from Oceti Sakowin camp) and 6) Snow at Oceti Sakowin Camp by Joel Martin. Newsletter : What is Stand With Standing Rock? Thank you very much for this excellent article about Standing Rock, and particularly on spiritually grounded social engagement. Many thanks & appreciation to Chris for setting aside the time & making the effort to go to Standing Rock and stand in solidarity … for the survival of humanity, and for humanity’s transition to harmony. Thank you for all your efforts. Be well. Thank you for your kind compliments … I will pass on your comment to Chris as well. Indeed our solidarity is what might turn things around at Standing Rock – both the land and water needs to be protected. 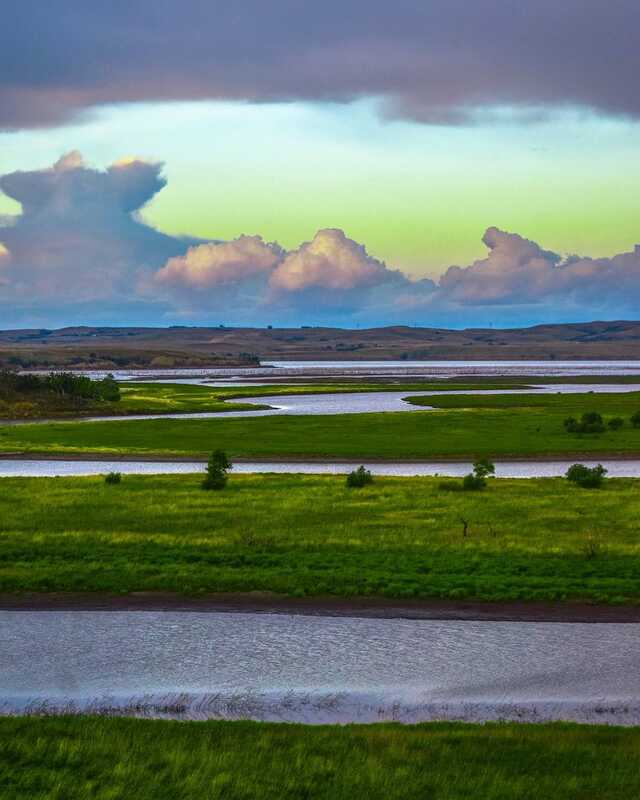 Yesterday, we published a newsletter dedicated to Standing Rock … to highlight its history, current ongoing news, and the many ways to help ensure its success. I honor your leanings towards this little piece of chaos unfolding right now. Not sure how you have arrived at the absolute conviction that the protesters are right and the anyone not in agreement is wrong. It seems like a distortion to use the Dalai Lama’s words as favoring the protesters. I would not consider myself wise enough to have THE answer to such issues. Watching it unfold and unravel and be so fraught with meaning is the best I can do. Relax my dears and row, row, your boat gently down the stream… life is but a dream. 1st thank you for taking the time to stop by and comment. Indeed life is but a dream… and in that dream we are invited to exercise discernment, balance, and equanimity – as much as that is possible. 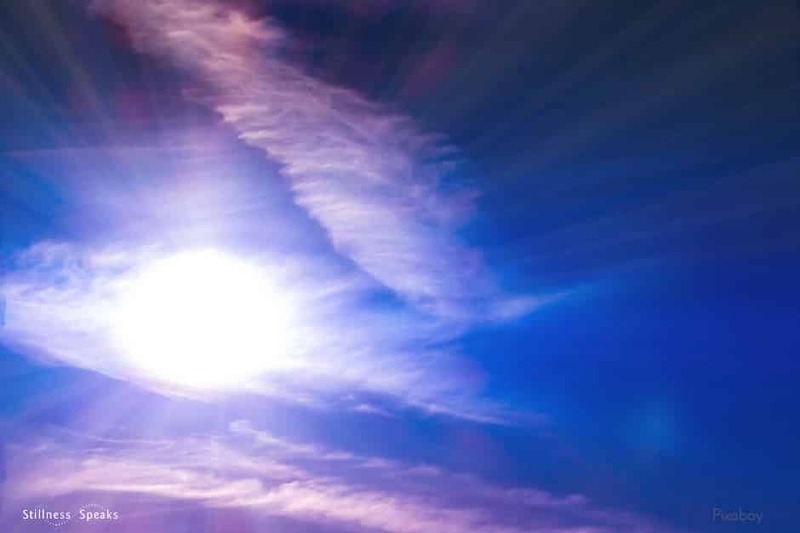 Of course, honoring the “other’s” perspective is very much a part of this journey … although that can be tricky and difficult, particularly when it comes to self preservation or preservation of Mother Earth – the only “physical” home we have. 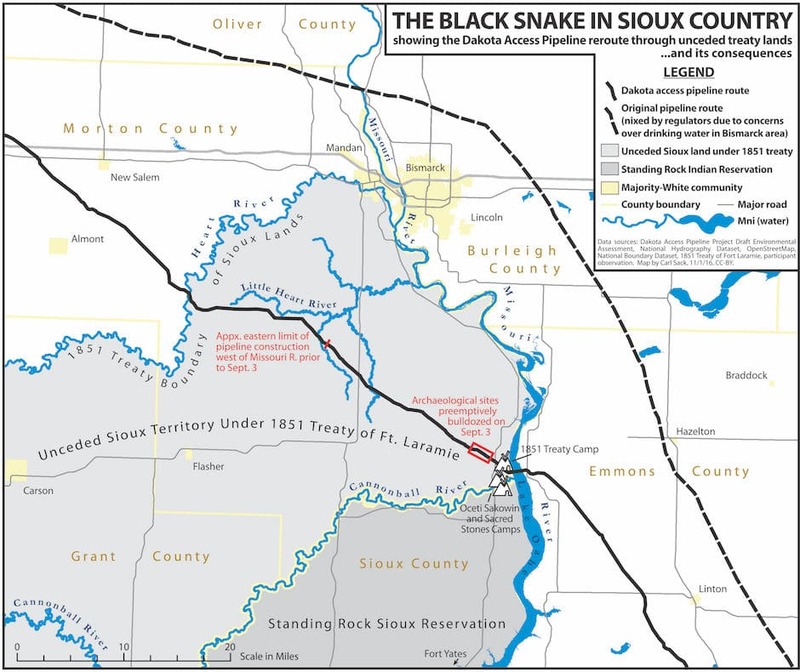 The issue of “oil and pipelines” is not an easy one and I, too, am not an expert … however, the Standing Rock matter seems quite clear to us – it’s a matter of honoring the Native Indigenous land while also ensuring that their drinking water (plus millions of others’) is not jeopardized … the reasons for our views are embedded in the various linked texts in this post, with a more exhaustive information shared in our Nov 30th newsletter – dedicated to this movement. Given that our “content-focus” is, and has been, on various spiritual traditions (& teachers), we wanted to offer a reason as to why we were writing about a “social issue.” This is why we offered H. H. Dalai Lama’s quote along with our own words re “why social engagement?” …. 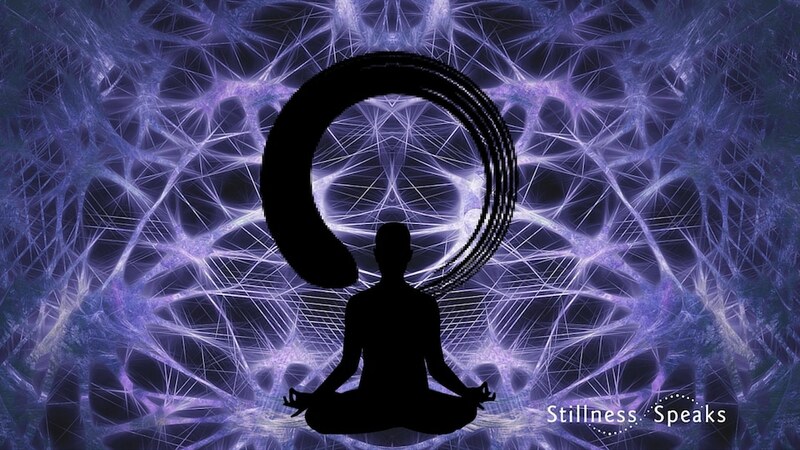 In our “view,” Self realization, or awakening, or spiritual practice, is not just within monasteries, ashrams, or retreats – it is very much in the “here and now” or “in the world” … also, we tend to “anchor” most, if not all, of our posts with pertinent “wisdom quotes” and H.H. Dalai Lama’s quote is such an “anchor” for this post. Again, we very much appreciate your taking the time to drop by and comment. I wish deepy to be at standing rock with you and all the brave one’s. I am however with you in spirit. Do not give up as millions of us are standing with you. Make sure to keep everything peaceful. Remember how Gandhi won over the British. With the utmost respect and love for all you are doing. Thank you for stopping by and offering your kind support to the Standing Rock movement.